Your little girl will be defending Townsville from the evil Mojo Jojo as Buttercup, the Green Powerpuff Girl. 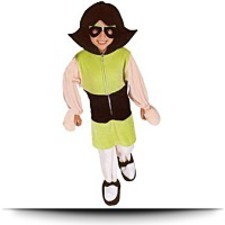 This child cartoon costume comes complete with jumpsuit, plush eye mask, and attached character headpiece. Machine washable gentle cycle. Line Dry.